The Greeks heard that Xerxes and the Persians were coming. They disagreed about what to do. 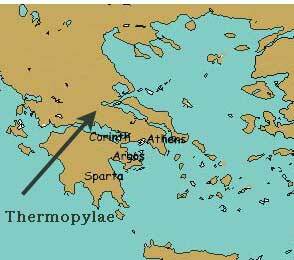 The Spartans and Corinthians wanted to abandon northern Greece and only defend southern Greece (where they were). 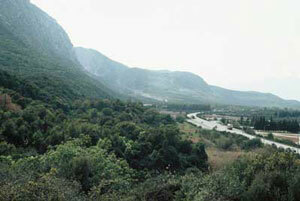 But the Athenians insisted that they should try to defend northern Greece at the pass of Thermopylae. The Spartans and Corinthians didn’t want to seem cowardly. So they finally agreed to try it. So the Athenians, the Spartans, the Corinthians, the Thebans, and some other soldiers from smaller cities all marched north to Thermopylae to try to stop the Persians. They got there and set up stone barricades. The Persians attacked, but for several days they could not get through the pass. The Greeks were happy that their plan was working. But after a few days, a Greek traitor told the Persians about another, smaller mountain pass where a few Persian soldiers could get through. Part of the Persian army secretly came around this back way and surrounded the Greeks. Although the Thebans surrendered to the Persians, most of the Greek soldiers were able to get away to the south. But they needed time to march away, so that the Persians coming through the pass wouldn’t catch them. A group of three hundred Spartan soldiers, along with some others, agreed to stay at Thermopylae and fight the Persians even though they were surrounded. They would fight as long as they could, to give the others time to get away. Cite this page: Carr, K.E. Thermopylae – Xerxes and the Second Persian War. Quatr.us Study Guides, July 9, 2017. Web. April 21, 2019.